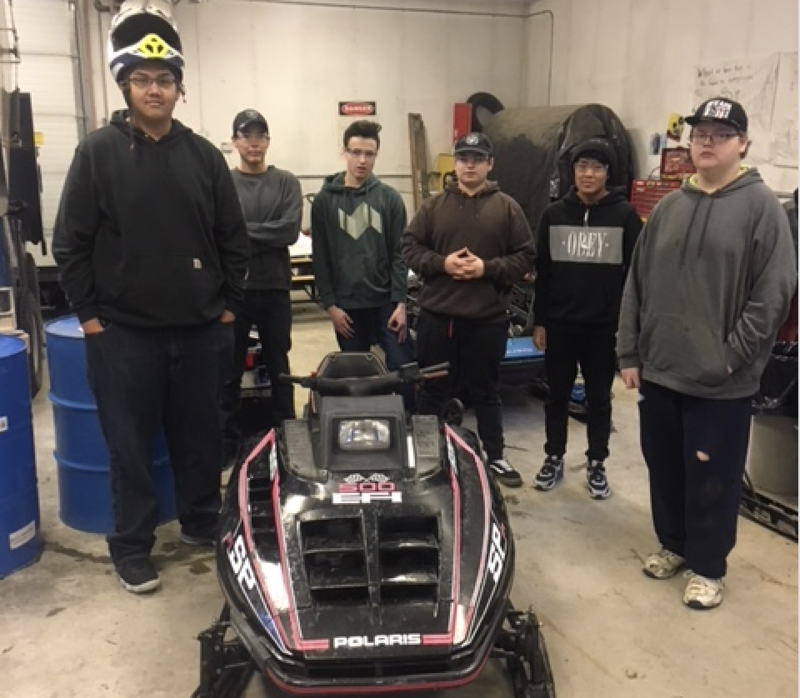 Tok School students taking the Entrepreneurship for Snowmachine Repair class have been busy during the two-week Aurora schedule. The students, guided by their teacher, community member Gary Antrim, have been working on repairing a 1991 Polaris Indy 500 efi. The machine had some problems - it was hard starting and not running properly. The students conducted trouble shooting through some standard checks. They conducted a compression check, a stator check and general connection checks. They found that the battery was disconnected, and also was not the proper battery for the machine. They learned that on this style efi, that improper battery size will affect the performance of the computer. Also, the battery must be hooked up as this machine's computer will not operate with out it. They replaced the plugs, checked for water in the fuel, and also checked coolant levels along with oil level. They topped the fluids off, replaced the battery, made a slight idle adjustment and test rode the machine. As another check, they left the sled out overnight to make sure it would cold start. Students were also working on related projects during this time. They used the internet to look up battery information and other information about repairs and parts on this particular model of sled. The snowmachine project belongs to Tad Dunning. Mr. Dunning has provided two projects to the class: his efi Indy is now complete and ready to return with a list of small items suggested to finish off, such as new skags on the skis and a low beam headlight to be replaced along with the windshield. His second machine is almost finished - it needs a key switch, fluids topped off, and skags on skis also. The class will be talking with him more about options for about these machines. He has told students he would like to keep costs down as he is wanting to sell these sleds. These first projects have given students lots of hands-on learning experiences about snowmachine repair, as well as an insight to the business angle that this type of shop work entails.